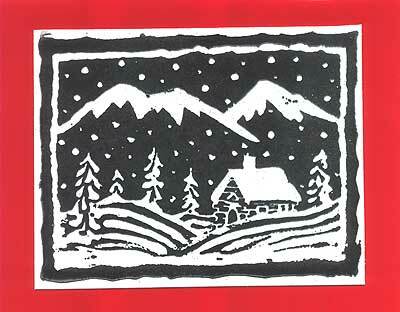 “Bold Print Snowy Cabin with Border” is stamped with a Graphite Black Brillance stamp pad on glossy card stock and embossed with a multi colored embossing powder that is glittery. This is layered on glossy red card stock. Card by Judy Conklin.